What Exactly is B2B Demand Generation / Lead Generation? Leads are the fuel for a successful B2B sales team. And leads are generated via a solid Demand Generation / Lead Generation function which is usually part of marketing. 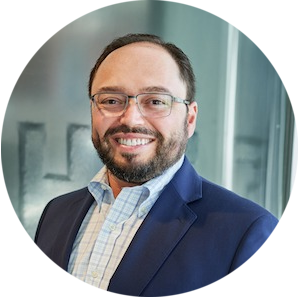 Every good VP of Sales or a CRO (Chief Revenue Officer) must first and foremost have an effective and well-oiled Demand Generation machine supporting the sales team’s success. Every VP of Sales knows that to hit the number there must be a predictable lead flow. And it goes without saying that a “lead” is not some cold name but is actually qualified prospective buyer who raised a hand – these types of leads are typically generated by your Demand Generation team within Marketing (and sometimes by Outbound SDRs who are typically part of the sales team). In other words, if you don’t have a Demand Generation machine in place then the VP of Sales and the sales team will struggle in hitting the number. And this is why I am writing this article – so that other CEOs, CROs and VPs of Sales really understand what they need to help drive revenue growth and to ensure they don’t develop a wrong strategy or hire the wrong people via a misunderstanding that Content Marketing or Inbound will generate the requisite lead flow they need to drive sales. What is B2B Demand Generation? Demand Gen is about getting prospective buyers in your target market to take action towards a point of expressing interest (even high-level – i.e. hand raisers) and then cultivating or nurturing these leads to a point where they are leveled up and are sufficiently high-scoring that they are now either MQLs or SQLs and are therefore *qualified* to be passed over to the sales team and can then be counted on to convert well into Opportunities in the Sales Pipeline. That is the aim of Demand Generation. The “Demand Gen / Lead Gen” process starts first with creating targeted awareness to attract interest that causes prospective buyers to express their interest via an inquiry. And this inquiry is the process of registering their contact information on your website whether it is on a traditional form or in a form of Conversational Marketing (this contact information is what your sales team needs (i.e. typically SDRs – Sales Development Reps) in order to be able to follow up on these qualified leads). As you can see from the above, Demand Generation is clearly a very strategic but also a very complex B2B function and responsibility and requires a lot of knowledge and experience to be done correctly, cost-effectively and with the requisite ROI. What makes it complex is that “it is more than just a branding concept or early buyer journey marketing tactic.” (as noted by Hubspot). It should be led by a highly experienced executive or functional leader who has deep hands-on expertise because it crosses multiple different B2B marketing and sales disciplines and a lot of strategic, process-driven and operational knowledge to correctly execute this function effectively. Adding to that, it’s especially important to have a leader who has made mistakes, missteps and failed a couple of times at Demand Generation – in order to know what to avoid – see this WSJ article by Sam Walker who is the author of an exceptional book called “The Captain Class” and this WSJ article is called “The Truth About Failing Spectacularly” – quoting: “The main reason veteran leaders rarely fail dramatically is that they’ve failed before.” Leading Demand Generation requires exactly that kind of a highly experienced leader who is surrounded by an army of experienced demand gen professionals. 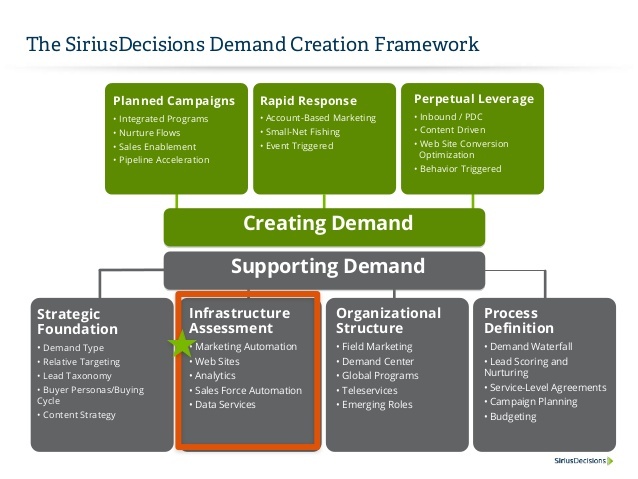 A good way to understand the full scope and complexity of Demand Generation is to look at the Figure below which is the “The Scope of Demand Creation” chart from SiriusDecisions (now Gartner). As it shows, there is a lot more to Demand Generation than meets the eye (and below, we detail that it’s far more than Content Marketing or Inbound Marketing). Managing Demand Generation is an expertise that can be obtained only over many years of experience and requires a lot of analytical and data-driven operational work to execute the Demand Gen strategy effectively. Engineering an effective “process” and managing the implementation and execution campaigns and programs that generate and nurture leads is key to Demand Generation. It’s all about Planning, Strategy and Execution (implementation) of campaigns and programs (and then measuring their progress). 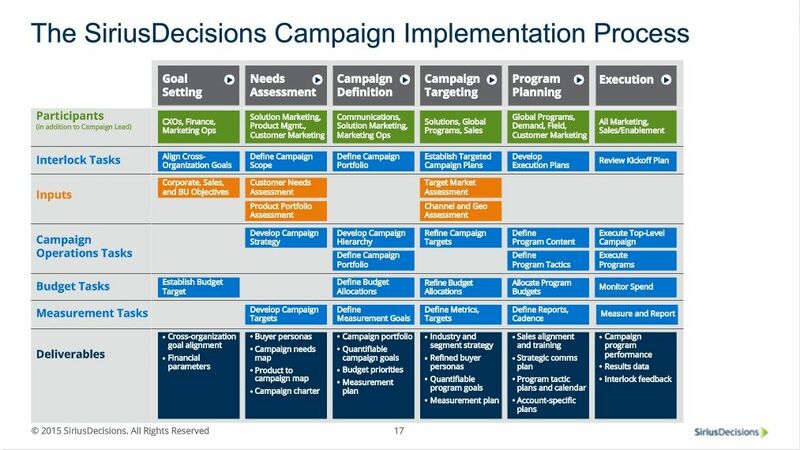 See the Figure below which is the “SiriusDecisions Campaign Implementation Process” chart from SiriusDecisions (Gartner). Again, Demand Generation is very complex, non-linear, requires a tremendous amount of knowledge, process engineering, strategic planning, and effective measurable execution, and operational knowledge. And again, the expertise required is something that takes many years of work of experience and understanding at a deep level what to do and especially what not to do (and it’s very nuanced, to add to the complexity). 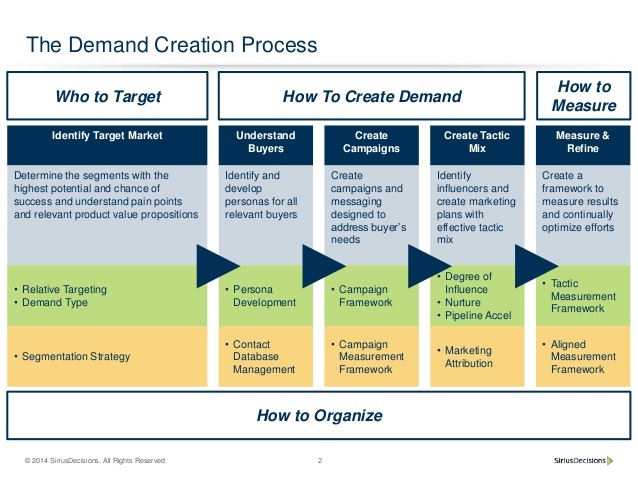 There is also a Process for targeting, and how to create demand and measuring. There are multiple different interlocked processes that have to be created and maintained and all of these layers of management add to the complexity of the Demand Generation function. 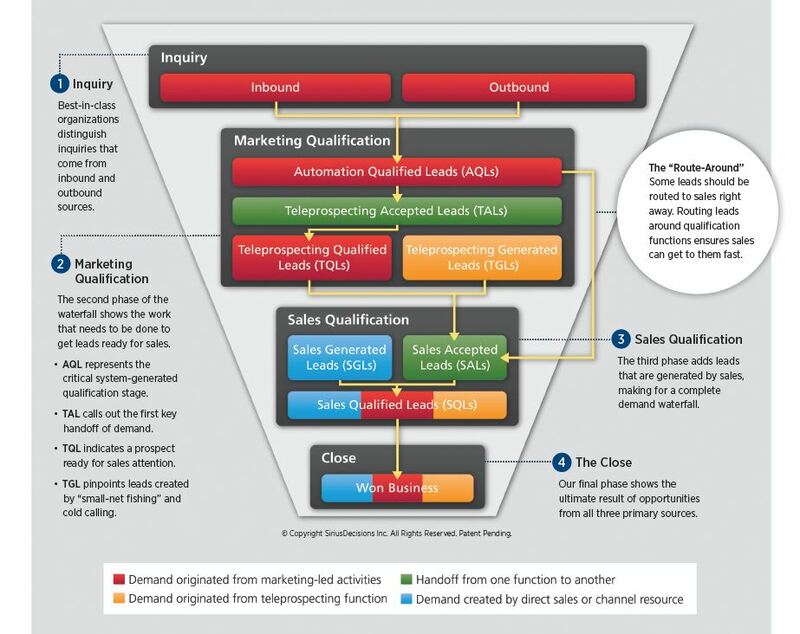 Part of the process is having a framework and using sales and marketing technologies like marketing automation systems to help with some of the more complicated programmings (and automated logical flow) of campaigns as shown below. Modern Demand Gen work requires planning a Demand Gen Strategy and program design which is based on experience and understanding of operations and technologies (sales & marketing tech stack) that yield the ROI on Demand Gen. 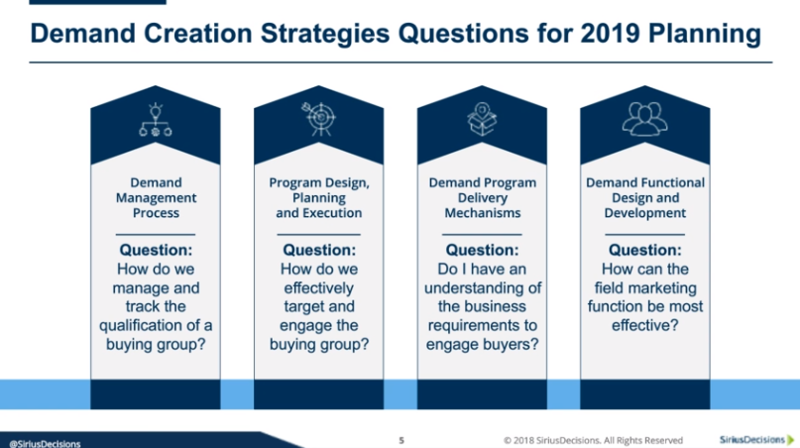 Here are the questions that SiriusDecisions posted for 2019 Planning. 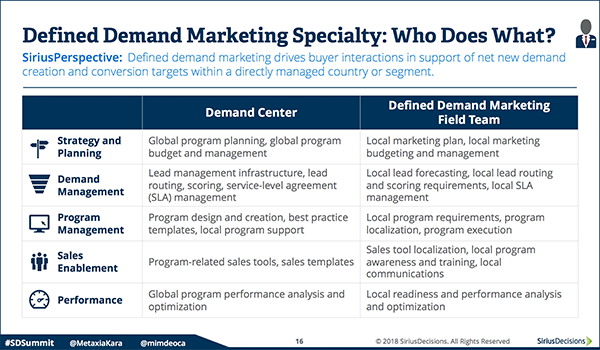 Figure: “Defined Demand Marketing Specialty” – SiriusDecisions (2018), now Gartner. 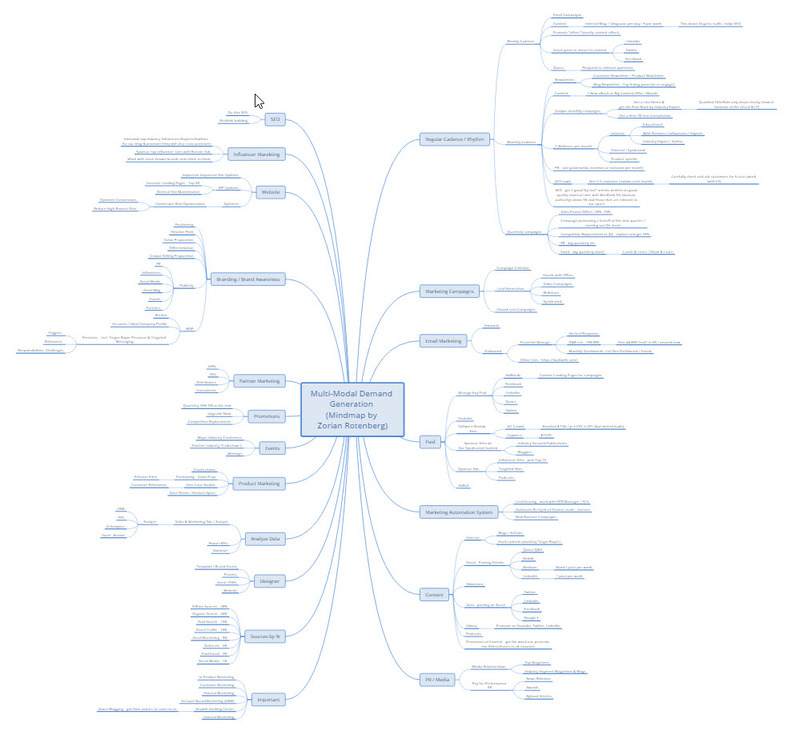 This is an example of a mind map to help visualize the many integrated programs and actions that are part of a bigger, structured, and effective multi-modal and multi-channel B2B Demand Generation Strategy. As evident here, there is a lot that goes into Demand Gen and it’s not simple. 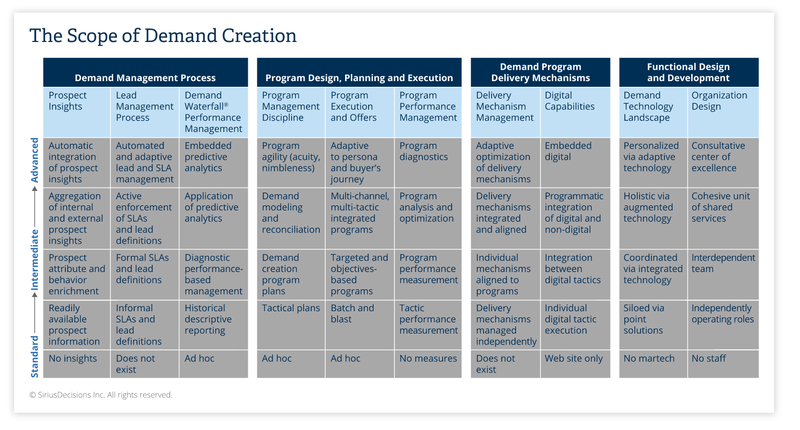 Figure: Key Parts of the Multi-Modal and Multi-Channel B2B Demand Generation Strategy. As shown in the visualization above, Content and Inbound makes up a small part of Demand Generation. They are important pieces but they are just factors in a considerably larger equation. The Demand Gen leader must understand the nuances and how the Demand Waterfall changed over time and why. The “under the hood” knowledge is critical to produce the best ROI. 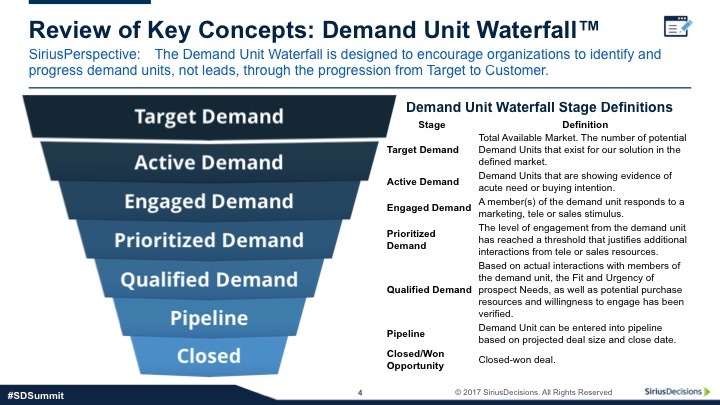 The Demand Gen leader must also understand the original or the 2nd version of the Demand Waterfall which was an important as it separated Marketing leads from SDR prospecting created leads. This is another “under the hood” experience picked up over time is critical to get the best ROI. The reason is that there are many techniques that were developed to generate leads based on this framework which work effectively well and can be optimized further with the 2017 Waterfall and that sustained expertise adds a lot of value to attaining the best ROI in modern Demand Gen. Finally, note that Demand Gen is not a static process or playbook that you can implement and just execute for the next year or few years. You need to regularly re-invent the system, process, campaigns, and even adjusts with the in- and out-flow of many key players on the team roster, etc.). What else? What are some other thoughts on defining Demand Gen and how it works in the modern B2B environment to drive revenue growth?